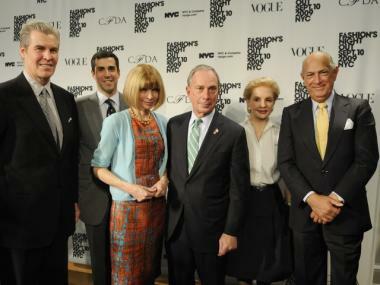 Mayor Michael Bloomberg joins Terry Lundgren of Macy's, Jim Gold of Bergdorf Goodman, Anna Wintour of Vogue, deisgner Carolina Herrera and designer, Oscar de la Renta at Fashion's Night Out, Fall 2009. CHELSEA — A new exhibition highlighting efforts by the "Save the Garment Center" campaign and backed by fashion icons including Nanette Lepore, Michael Kors and Diane von Furstenberg launched in Chelsea last week in time to coincide with Fashion Week. Designers like Lepore are worried that rising rents and the commercialization of the garment center will drive fashion industry manufacturers out of the area, leaving young designers like those showcased at the “Emerging Design” exhibition without the tools necessary for their trade. “Students from FIT and Parsons can cross the street to the Garment Center, get their materials from specialized local suppliers and then visit the factory where their visions can come to life," Manhattan Borough President Scott Stringer told DNAinfo. The “Emerging Design” exhibition shows a collection of fashions — from evening gowns to casual outfits — by young designers who are currently working at the Chelsea gallery Sebastian + Barquet at 544 W. 24th St.
"New York's Garment Center, even in its current state, is living proof that design can be an effective tool for economic, social and cultural metropolitan development,” designer and exhibition host Wayne Diamond told DNAinfo. “Its closure would be a loss not just to the design world but for the city as a whole." Ali Taghavi, who has designed for DKNY, Tommy Hilfiger and Liz Claiborne, is showing at the exhibition, along with Richard Lowe who has a couture line.